Sofia Högstadius is one of the most active of Sweden’s new generation of creative, multi-genre violinists, well known both as solo artist and ensemble musician. 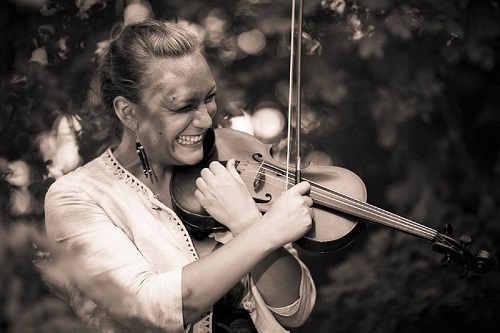 Specialized in Bulgarian and Swedish folk music, she is teaching ensemble and violin at the world music department at the Academy of Music and Drama in Gothenburg, Sweden and freelancing as a violinist in many groups and collaborations. Spring 2017 will include a tour around Europe with progressive metal band In Flames, release of radikal swing collective Cats and Dinosaur’s second album, a study trip to Venezuela for El Sistema Sweden, collaborating with the Syrian musician Murhaf Fanous and performances at Umefolk and Hemavan Folk Fest, and much more. Sofia is involved with several musical projects around Europe, including duo Vladimirov-Högstadius with Bulgarian tambura master Vladimir Vladimirov, Slovenian singer and harpist Zvezdana Novaković (Voice of the Strings) and the trio The Breaks with Slovenian accordion and puppet theatre magician Matija Solce and Chilean/Swedish percussionist Stefan Hedborg. She is also a member of Kate in the Kettle – the Scottish fiddler/singer Kate Young’s string quintet project, who during 2016 played in Linköping Folkmusikfestival, Umefolk, Hemavan Folk Fest and Skansen. She is also regularly touring with her bands all over Sweden such as klezmer quartet Zemer Kapell, pop band Winhill/Losehill, radical swing collective Cats & Dinosaurs and also touring as a regular substitute with Swedish folk band Navarra, feministic folk funk colective Sallyswag, Olivia’s Poesiorkester, World Wide Orchestra and occasionally in world music band Ethno In Transit. Fall 2016 Sofia spent touring full time with the Swedish National Theatre production Tjärdalen, playing music written by Winhill/Losehill composer Jonas Svennem. In the performance she played viola, saw, percussion, mandolin, banjo, piano and voice.